OK, parents, 'fess up: you've done it, too, right? Look under the table to see what I'm talking about. But -- and it's a big but -- here's the difference. Have you ever left a diaper on the floor and then listed your house on the interweb machines for everyone (including Kati, who found it) to see? I really like the floor vent placed in front of the bathroom sink ... great for drying those hard-to-reach areas after the shower and while brushing the teeth. Or tooth. Whatever. What makes that even more remarkable is that the person taking the photos managed to contrive to keep themselves out of the photo of the tub despite the mirrored wall. If you look to the bottom left hand corner, you can see the toilet (put the seat down, folks), and if you look in the mirror behind the tub, you can see the doorway leading into the room but there's no person there. That had to take some careful shooting, yet they missed the loaded missile under the coffee table? they bought a brand new vacuum to spiff up the house for the photo - but they couldn't toss the nappy? Ha! My husband told me to stop trying to find our next house on this site. I just want to know why the house looks like it was plucked from 1985? Please tell me it was a GRANDparent who left that dirty diaper on the floor. Or that picture was actually taken in 1970, when the seller was a baby. Please? Diaper, shmiaper! I want to know about that hideous red tower-y looking thing on top of the VCR / DVD player! Did you catch sight of the toilet in the mirror? That is unfortunate. 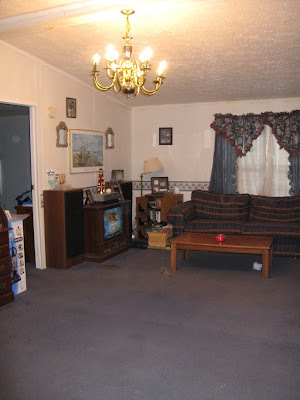 I want to know why all the furniture is cowering in the corner of the living room. I choose to believe that in all these cases, the agent showed up without warning to take the pictures. It's all I can think. Or the people don't really want to sell, and the bank is forcing them? The alternative is that they're all insane. Yeah, I'm going to keep my delusions. Looks like they missed their eye drops or nasal spray on the bathroom floor under the cabinet, too. Judging from the decor, I'm pretty sure that's an adult diaper, because the people who live here MUST surely be too old to have a child in diapers. SURELY! PLEASE? I think its excellent that they used photobucket to host the images. And the images of their family and everything else. Some things don't need to be shared.